Moose is a “mottled gray” greyhound pup, born into the wild and left alone when his mother and sisters are rescued by a local rancher. Meeting at a Montana greyhound track where Moose and DeGaule totally disrupt the outcome of a race, they accompany Bruce home only to disrupt his mother’s bridge party. 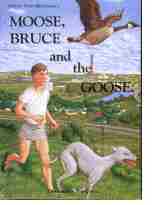 The acion proceeds at a fast pace as the dog and the goose help Bruce train for the high school track team. At one point, DeGaule returns to the wild only to return with 5,000 friends just before the state track championship which is decided by a most unusual photo finish. This book is an absolute delight from beginning to end. Highly recommended. The book is illustrated by Tom Quinn, a well known artist from Spokane, Washington, who, in addition to illustrations, has painted murals on the sides of a number of buildings, etc. in the Spokane area.